Our Sato Dog Reunion Featured by AM New York! 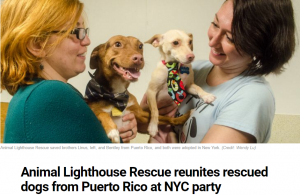 We hosted a sato dog (Puerto Rican street dog) reunion party for Animal Lighthouse Rescue! ← Our Sato Dog Reunion Featured by The Westside Spirit!